No need to hold your cards secret in this game. In fact, Brink makes you throw them in hopes that they almost fall off the table. 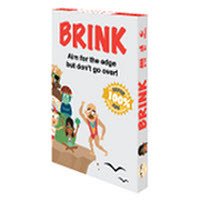 Brink is a clever game where players try to throw the game cards to a point where they are just at the brink of falling off the table. If you go too far and they fall, you'll get zero points. Stand up and get the whole family involved in this card throwing game. Easy to take with you, easy to learn, easy to play and a whole lot of fun. Brink is made to last and will become a fun family favorite for years to come. Give Brink a try today! Review Completed (2017-09-20) From a sheer act of boredom tossing expired credit cards across a table (love the backstory) to a clever and professionally designed tabletop game, Brink is a game that stands apart from your typical card game. We were excited to give this game a try and we were not disappointed. It's very simple to learn how to play and doesn't take the whole afternoon to play (although after a few exciting rounds that turned into a couple rematch games we had been playing for a while). Even better, we loved the low age limit and how it can include just about everyone. The quality and packaging of this game is genius. The cards are made from plastic and are similar to a credit card. The printing looks great and we loved the graphics. The little box that the cards sit in is quite a work of art. It reminded us of a gum box that folds around and tucks into a slit on the side of the box. Not only is the "tuck box" made from thicker material, when you unfold it, it flattens into your rule book since the inside is full color printed with rules. We loved how this game was physically made and packaged. About 40% of the game could be strategy and the left over 60% boils down to raw card-throwing talent mixed with luck. Some players just threw the cards (with all different styles and techniques) while others tried to strategically throw the special cards in an attempt to gain more points. This worked some of the time and added to the excitement and fun filled aggravation of the cards not doing what you want. The only thing missing was a way to keep track of your points but that is easily done on any piece of paper. Depending on who you are playing with, a yardstick might come out to be absolutely sure a card has crossed the line to be in the scoring zone or in the 2X-your-score zone (we may or may not be speaking from experience). Player with the highest cumulative score at the end of the round wins. You'll get 12 plastic cards and the official Brink game rules and instructions. Please keep in mind that the official Brink dice-card rules and instructions could be different depending on the game version you have. The rules below are some of the exact directions on how to play Brink. Share with us your comments, funny stories, tips, advice, strategies, creative ways to play, questions about how to play, problems with the rules or anything you want about Brink. All submissions will be reviewed within 24 hours. Click here to add your Brink comments.